By notable players, I mean people, whose names I can find, who were directly involved in the peace talks in Nanking leading to the signing of the Treaty. Major, 3rd (Prince of Wales's) Dragoon Guards. Secretary of Legation. Chinese Secretary and Interpreter. Employee of the British Foreign Ministry. 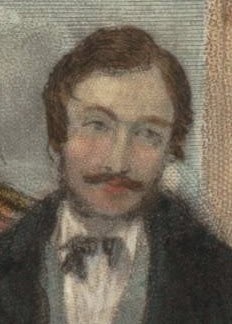 Second son of Robert Morrison 馬禮遜, the first protestant missionary to work in China. Assistant Translator and Interpreter. Employee of the opium firm, Jardine, Matheson & Co.; seconded to the British armed forces during the First Opium War. Interpreter. Employee of the British Foreign Ministry. Prussian missionary belonged to the Netherlands Missionary Society. Lately interpreter of the opium firm, Jardine, Matheson & Co. Lately British magistrate of Chusan following the British occupation of the island in 1841. Official role in the peace talks unknown [to me]. Parkes married Karl Gützlaff's sister Mary Wanstaff Gützlaff. He was employed by John Robert Morrison. It is unknown [to me] if he was an employee of the British Foreign Ministry. He was attached to the expeditionary force to sail up the Yangtze River from June 13, 1842. Head of the delegation. Imperial Commissioner. Manchu, direct Imperial Clansman (Aisin Gioro 愛新覺羅). Member of Gulu Lamun Gusa (Manchu Plain Blue Banner) 正藍旗. Tutor of the Crown Prince 太子少保 [A civil title; he performed no tutorial duties of any sort.]. Military Official of the First Rank 頭品頂戴. General of Canton Garrison. Second-in-command of the delegation. Imperial Commissioner. Manchu, collateral Imperial Clansman (Aisin Gioro 愛新覺羅). Member of Kubuhe Suwayan Gusa (Bordered Yellow Banner) 镶黄旗. Military Official of the Fourth Rank 四品顶戴. Deputy Lieutenant-General, Commander of Chapoo Garrison 乍浦副都統. Imperial Guard of the fourth grade, under the command of Keying. Manchu. Viceroy of Liang-Kiang 兩江總督, based in Nanking Manchu. Manchu. Mayor of Nanking 江蘇按察使署江寧布政使. Han. Chang Hsi 張喜 Servant in Elepoo's household. Han. Chen Zhigang 陳志剛 Waiwei of the Ninth Rank 九品外委 [equivalent to a Lance-Corporal]. Han. Liu Jianxun 劉建勛 He was described as a trusted lieutenant of Keying. It is unknown [to me] whether he was a government official or a member of the Keying household. Han. Tafenbu 塔芬布 Captain with the Manchu Banner Army at Mukden Palace (Shenyang Imperial Palace] 盛京佐領 (either of Third or Fourth Rank). Hanchu. Xu Jiahuai 徐家槐 County Mayor of Taicang (a county of Suzhou) 太倉知州. Han. Xie Jichao 謝繼超 Waiwei of the Ninth Rank 九品外委 [equivalent to a Lance-Corporal]. Han. 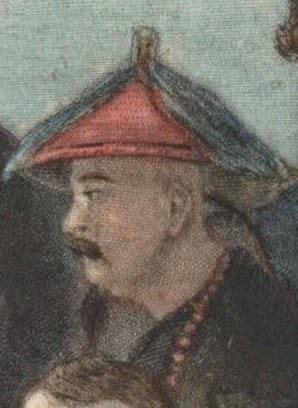 Zhang Panlong 張攀龍 Military officer Subordinate of Niukien. Han. Lu Zezhang 鹿澤長 Intendent of Lingshiu Circuit (comprising Ningpo-fu, Shaohsing-fu and Toi-chau-fu) 寧紹台道. Han. March 10 1/25 Lin arrives at Canton. April 11 2/28 22 opium hulks, originally moored at Lintin, arrive at Chunhow (near Chuenpee, in the neighborhood of Bogue forts). Surrender of opium begins. June 3 Destruction of opium at Chunhow begins. August 10 6/24 Pottinger arrives at Macao to take up his position as the British Plenipotentiary. The expedition to the north is decided upon. August 21 7/5 Pottinger proceeds to Hong Kong and sees the island for the first time. He meets with George Burrell, Major-General, commander of the Hong Kong garrison, and Alexander Robert Johnston, Administrator of Hong Kong, to make arrangements concerning the defense and governance of the island. August 22 7/6 The British invasion force commences its northern expedition. The naval squadron, comprised of 14 fighting ships (four of them armed steamers), 15 troop carriers and six transports, is under the command of RAdm. 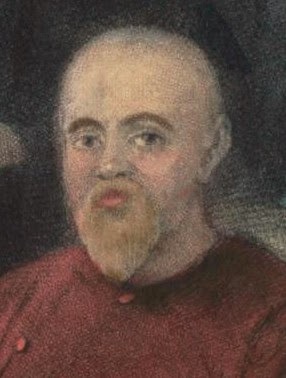 William Parker. August 25 7/9 The expedition arrives at and anchors off Amoy. August 26 7/10 Pottinger issues a surrender ultimatum to the Ch'ing naval commander in Fukien [British Surrender Ultimatum, Amoy (8/26/1841) ]. Attack on Amoy begins at 1pm. August 27 7/11 The walled city of Amoy falls; the Battle of Amoy draws to an end. September 5 7/20 The expedition weights and makes sail for Chusan, leaving behind three fighting vessels, three transports, with 500 troops to garrison Ko-long-soo. September 25 8/11 The expedition assembles off Chin-hai and Ta-hae River [east of Ninpo]. October 1 8/17 Attack on Chusan begins. The battle is mostly over by 2pm. Ting-hai, the county seat, falls and Chusan is again captured by the British. October 8 8/24 The expedition, less three transports left behind in Chusan, is again assembled, this time, to act against Chin-hai. Before leaving Chusan, Pottinger installs a military government at Ting-hai. October 10 8/26 Attack on Chin-hai begins at an early hour. Fighting was over in the afternoon; Chin-hai falls. October 13 8/29 The expedition leaves Chin-hai for Ningpo upstream [the cities are only 20 kilometers apart]. The Ch'ing garrison abandons Ningpo; British troops enters the walled city without firing a shot. Ningpo becomes the fourth city to fall to the British since the expedition left Hong Kong 52 days ago. No further attack is launch for the next two months. Ch'ing army deploys garrisons into counties surrounding Ningpo, viz. Yuyaun, Tseke, and Funghwa, to cutoff supply routes of the British. 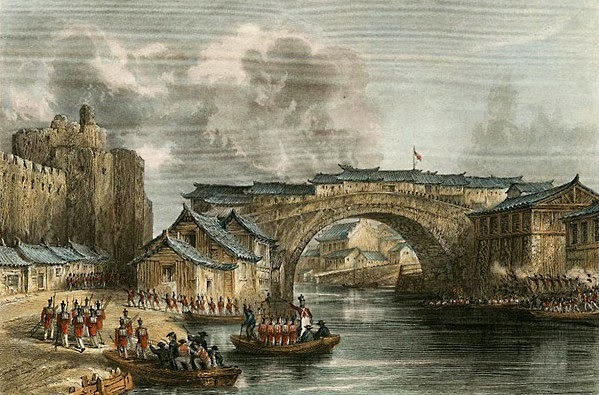 December 27 11/15 The British acts against Yuyuan with a smaller force of several fighting vessels and 700 men. The Ch'ing garrison has left before the arrival of its adversary; British troops enter the city unopposed. December 30 11/18 The British takes Tseke in the same way Yuyuan was taken. January 10 11/29 Funghwa is taken by the British in the same manner as Tseke and yuyaun. February 24 1/15 Keying is appointed General of the Canton Garrison. March 10 1/29 Ch'ing forces launches a simultaneous counterattack against the British at cities they now hold upon nightfall. About 10,000 to 12,000 men advance as far as the market at the city center of Ningpo, but are repelled by British artillery and troops. The smaller force that tries to overcome the north gate at Chin-hai is repulsed by the guards. Ch'ing forces retreating from both locations are pursued by British troops. The Ch'ing navy throws a vast number of fire-rafts and fire junks at British ships moored at Chin-hai and Ningpo. They are either towed on shore or instantly destroyed; the British records no injury to their ships. March 28 2/17 Keying is ordered to proceed with haste to Chekiang to take up the position of Acting General of the Hangchow Garrison 杭州將軍篆務. Elepoo and Hienling were ordered to immediately proceed to Chekiang to be Keying's general staff. An engraving titled "Engagement at the Joss-House near Chapoo". May 18 4/9 Battle of Chapoo. Chapoo falls. May 23 4/14 British troops withdraws from Chapoo. May 25 4/16 Keying appoints Elepoo Commander of the Chapoo Garrison. June 13 5/6 Pottinger sails from Hong Kong to join the expeditionary force. The expeditionary force enters Yangtze River. June 16 5/9 Battle of Woosung (Wusong) 吳淞戰役. British forces overrun the battery at Woosung Estuary 吳淞口. Bosan County (Baoshan) 寶山縣 falls. June 19 5/12 Shanghai falls. 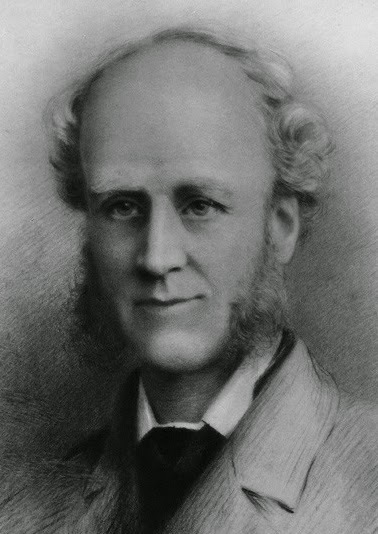 June 22 5/15 Pottinger arrives Shanghai; joins up the Expedition. June 23 5/15 British troops withdraws from Shanghai. West Gate of Ching-Keang-Foo", sketched on the spot by Lieutenant James Stoddard of HMS Cornwallis. July 21 6/14 Chin-kiang-fu (present day City of Zhenjiang 鎮江市) falls. British armed forces head for Nanking. July 22 6/15 The ransom of $500,000 is offered by Kwachow, lying opposite to Chin-kiang-fu, to the British, purchasing exemption from the assault [unknown if the payment was in fact paid in full]. July 26 6/19 Emperor appoints Keying and Elepoo Imperial Commissioners. July 27 6/20 Emperor instructs Keying and Elepoo to engage the British armed forces in peace talks. July 30 6/23 Keying informs Pottinger in writing his government's desire to negotiate a truce and discuss terms for an agreement to end all hostilities. 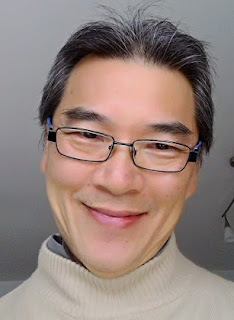 Chen Zhigang returns with a letter from Pottinger, in which he says he is not to hold peace talks with Keying and Elepoo unless the Ch'ing mission can produce written document to identify them as plenipotentiaries. Chen is sent to see Pottinger again carrying a letter form Niukien stating that in the Ch'ing system, Imperial Commissioners carry the weight and function of that of plenipotentiaries. Keying and Elepoo are the bona fide envoys of the Emperor. Niukien requests the presence of Keying and Elepoo at an emergency meeting in Nanking. At the time, both of them are in Wuxi 無錫. August 6 7/1 A full complement of fighting force of the British fleet of no less than 80 vessels and 4,500 troops are stationed outside Nanking. August 7 7/2 Elepoo sends Chang Hsi to Nanking ahead of himself. Chang was given a temporary (or brevet) commission of the fifth rank military officer 賞五品軍功頂戴 [Roughly the rank of a captain or a major in the Western army ranking.]. August 8 7/3 Elepoo arrives Nanking. August 9 7/4 Pottinger arrives Nanking. Elepoo sends Chang Hsi, Chen Zhigang and Liu Jianxun to see Pottinger carrtying a letter he wrote to the British Plenipotentiary. Pottinger dismisses Elepoo's communication as unfocused and unhelpful to the situation at hand. The properness of Keying and Elepoo's credentials at the peace talks is discussed; the issue is settled on the basis that they are Imperial Commissioners instructed by the Emperor to engage the British armed forces in peace talks, although they have not been appointed Plenipotentiaries. 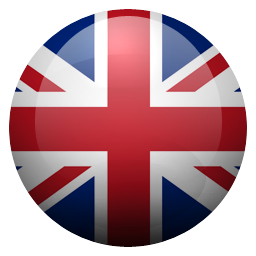 It is agreed that the British delegate will layout their demands in writing for collection by their Ch'ing counterpart on the following day. Additionally, Morrison demands an immediate payment of 3 million dollars as ransom for Nanking. August 10 7/5 Chen Zhigang and Zhang Panlong are sent to the British to collect the statement of the terms of demand 向大清國所要各條. They also carries Niukien's reply to Morrison to say that it is difficult to raise three million dollars in such a short notice, the office of the Viceroy of Liang-Kiang, however, plans to instead offer one million dollars to compensate the expenses of the expeditionary forces. Chen and Zhang returns without the terms of demand, and instead a message from the British that the they will attack at daybreak the following morning. Not long after the news of the imminent attack was brought back, Xu Jiahuai is sent to the British as Niukien's envoy and vows to pay the demanded ransom, in full. August 11 7/6 At dawn, Elepoo sends Chang Hsu, Chen Zhigzng and Xu Jiahuai to the British carrying two letters addressed to Pottinger. In the first one, he reiterates he and Keying are the accredited representative of Dai Ch'ing. In the second, he states he and Keying are authorized to negotiate and accept conditions relating to compensating opium dealers for opium confiscated [in March 1839], opening trading ports and lifting the 'Cohong' trade restrictions, etc., and to conclude and execute an agreement. He says further the negotiation may begin in earnest upon the arrival of Keying in Nanking. Pottinger finds the contents of Elepoo's letters acceptable. He told the Ch'ing envoys he is willing to forgo the ransom demand. Orders are given to stand down the attack. Keying arrives Nanking. The two missions agree to begin formal sessions of the peace talks from the following day. August 12 7/7 Formal deliberations of the peace talks begin. Members of the Dai Ch'ing mission includes Tafenbu, Chang Hsi and Chen Zhigang. 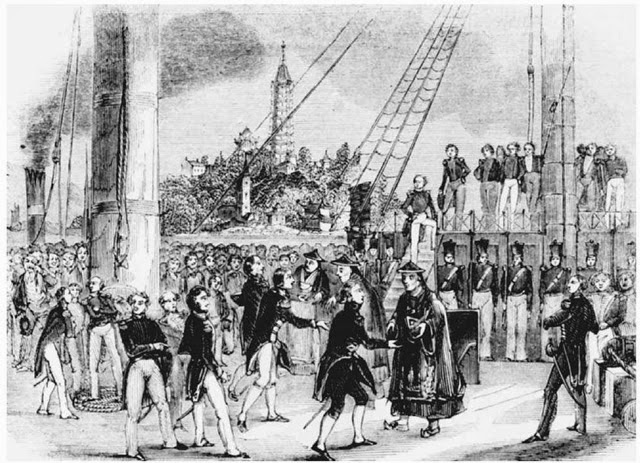 They proceed to the British steamer "Queen" [to be verified], the seat of Pottinger, carrying with them a communication signed by Keying and Elepoo verifying their credentials. The British mission moves to make a change of venue to Jinghai Temple 靜海寺 in Xiaguan 下關, west of the walled city, citing the temple is roomier and cooler. The new venue is accepted by the Ch'ing mission. The British mission, comprised of Malcolm, Morrison, Thom, Parkes and Woosnam, arrive at the temple at around 11am. August 14 7/9 Keying informs Pottinger the British terms have been accepted. August 20 7/15 Keying, Elepoo and Niukien met Pottinger. August 22 7/17 Emperor gives conditional assent to the term sheet. Items not approved or needing further considerations are: Foochow-fu shall not be a treaty port; trading between Britian and Dai Ch'ing shall follow the old system that has proven to be effective; Keying and other shall study and duly report to the Emperor the disadvantages of involving British consular offices in tax and levy matters instead of cohongs. The Dai Ch'ing Mission boarded HMS Cornwallis for the treaty signing. August 29 7/24 Treaty executed by Pottinger, Keiying, Elepoo and Niukien on board HMS Cornwallis. September 14 8/10 British fleet begins its withdrawal from Nanking. September 15 8/11 Imperial edict (Emperor's assent to the Treaty) arrives Nanking. October 6 9/3 The Yangtze River is free of British naval fighting vessels. December 28 11/27 Queen ratifies Treaty. March 4 2/4 Elepoo dies of illness in Canton. April 5 3/6 Hong Kong is constituted officially a colony of the British Crown [Letters Patent 1843] [799 days after British forces, acting unilaterally on a peace treaty that had never been signed, landed in and took possession of the island]. June 26 5/29 Ratification is exchanged in Hong Kong. 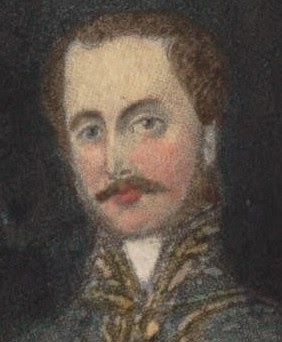 Pottinger is appointed the first colonial governor of Hong Kong. August 21 7/26 Morrison is appointed a member of the Legislative and Executive Councils of Hong Kong. August 31 7/7 Morrison dies from fever in Hong Kong (at the age of 29). June 21 5/6 Pottinger departs Hong Kong. He is replaced by John Francis Davis as Hong Kong Governor. 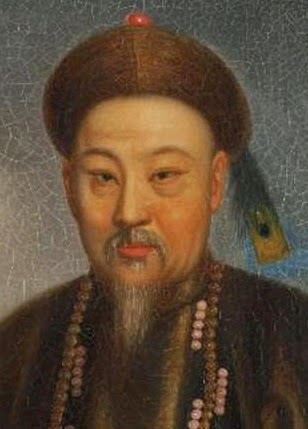 February 25 1/14 Emperor Tao-kuang dies. The year of the reign of Tao-kuang. Date in the lunar calendar (moon/day).